The breakdown of the immune system is resulting in many chronic ailments of the 21st century. A response system known as immunomodulation can help support the immune system using biological co-factors along with specific nutrients and herbs. Immunomodulation is crucial for modifying the immune response to properly defeat infections in the body. One of the greatest immunomodulating weapons for the immune system is found in compounds called beta glucans. A healthy immune response is triggered when infectious and foreign agents such as bacteria and viruses invade the human body. As a result, the immune system responds with key inflammatory markers designed to attack the site of infection while causing minimal damage to the rest of the body. Decreased immunity and an overactive immune response can result when the body is overstimulated with real and perceived threats. This leads to a weakened immune system, and the individual will become more susceptible to the development of cancer and infections. Individuals with an overstimulated immune system also have an increased risk of chronic inflammatory conditions such as autoimmune disorders and asthma. 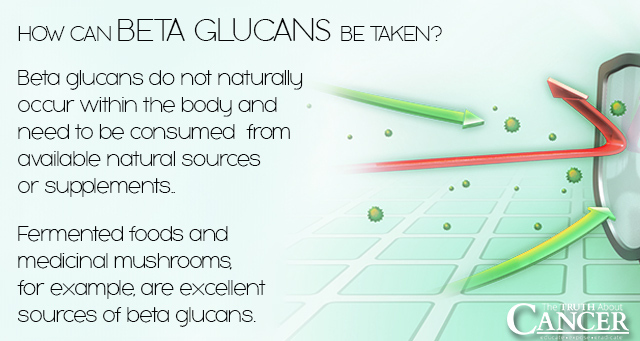 Beta glucans do not naturally occur within the body and need to be consumed from sources such as mushrooms and yeast. The polysaccharide compound beta glucan is comprised of sugar molecules joined together. Polysaccharides have the ability to carry biological data as a result of their supportive structural capacity. Branch-like structures result from polysaccharides joining together at several locations and the length and position of the beta glucan structure is referred to as Beta 1,3D glucan. Beta glucans bind and help specific immune cells to achieve a well-coordinated attack on their targets. Scientists refer to beta glucans as “biological response modifiers.” A modified response supports immunomodulation by preventing hyper inflammation and an autoimmune response. The rapid growth of cancer in healthy individuals can over-activate an individual’s immune system. Beta glucans bind and activate specific innate immune cells including macrophages, antibodies, and natural killer (NK) cells so that it can trigger an immune response. The ability of beta glucans to modify the attack of immune cells on invasive agents supports an efficient and stronger immune response. 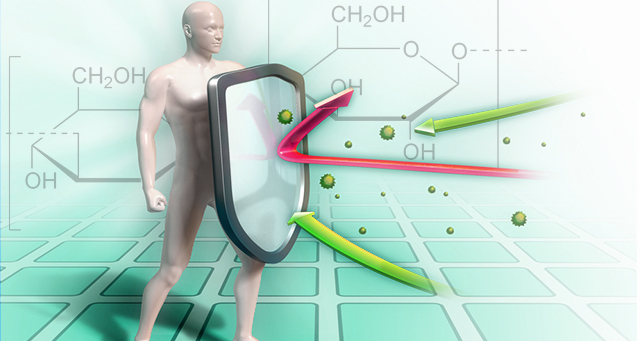 Beta glucans prime immune cells to recognize complementary immune defense compounds. The antibody antigen response is coupled with beta glucan for a biologically synergistic response to kill cancer cells. The coupling of these two defense tools may even be a stronger therapy than chemotherapy or radiation. Furthermore, the ability of beta glucans to work in cooperation with antibody complexes poses no adverse health reactions as do conventional cancer treatments. Beta glucans effectively stimulate an immune response from T-cells, NK cells, cytokines interleukin (IL) 1 and 2, as well as macrophages. 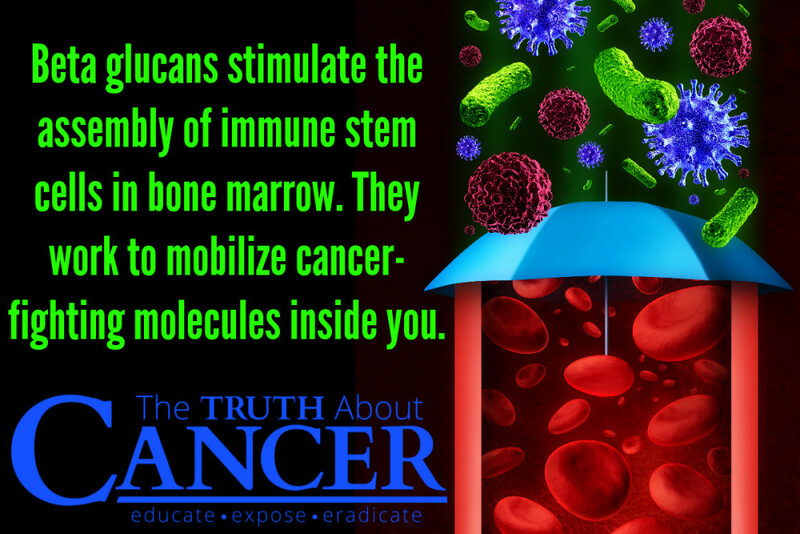 Research supports the ability of beta glucans to reduce the growth rate of cancer cells all while stimulating a stronger immune response to foreign invaders. Specifically, NK cells are crucial to inhibiting cancer growth and are solely responsible for detecting and controlling tumors. NK cells seek and destroy tumor growth. Additionally, beta glucans stimulate the assembly of immune stem cells inside bone marrow. New immunocytes are released into the blood and varied lymphoid organs. This will increase the immune police work against potential invaders and improves the attack against cancer. This can be critical for individuals receiving conventional cancer treatments such as chemotherapy or radiation. These treatments make the body more susceptible to infection by decreasing circulating immune complexes and immunocytes. Beta glucan also stimulates various cells within the body to unharness anti-cancer molecules throughout the body. These molecules can include interleukins 1 and 6, hydrogen peroxide, gamma interferon, and tumor necrosis factor which have been shown to fight cancer and stimulate a healthy immune response. The Montana Center for Work Physiology and Exercise Metabolism released a report showing that beta glucans can mitigate the common cold and control tumor cell growth. One of the most critical factors at preventing the development of chronic inflammatory disease and infection is a strong immune system. Beta glucan exhibits remarkable effects at both priming immune cells and coordinating a successful immune response. Over 1,000 scientific articles have been published reporting the many biological benefits of beta glucan. Beta glucan is also one of the safest therapies available with immunostimulating and cancerostatic properties. Compared to traditional medical therapies, beta glucans are affordable and a safe alternative for preventing and healing cancer. How Are Beta Glucans Harvested? As was previously mentioned, beta glucans are not synthesized by the human body and must be consumed from available natural sources. Beta glucans are found in the cell walls of yeast which can naturally be extracted. Fermented foods and medicinal mushrooms are also excellent sources of beta glucans. Studies show that an increased biological response and immunomodulation is best exhibited in insoluble beta glucan as opposed to its soluble form. Insoluble beta glucans are found in saccharomyces boulardii, brewer’s yeast, and medicinal mushrooms including maitake, agaricus blazei murrill, and reishi. Indigestible soluble fibers from barley and oats contain beta glucans and exhibit and anti-inflammatory biological effects. In order to improve immunomodulation (for the optimal health and function of the immune system) it is recommended that insoluble beta glucans be supplemented into your diet. If you fear your allergy to yeast may prevent you from taking beta glucan supplements, you shouldn’t worry. The isolates found in beta glucan supplements have been separated from all possible proteins that may cause harm. For best results it is recommended to take 500mg – one to two times daily and always outside of meal times. 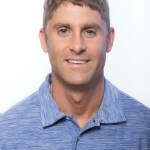 The breakdown of the immune system is responsible for many chronic ailments and diseases. A response system known as immunomodulation can help support the immune system. One of the best immunomodulating weapons is found in compounds called beta glucans. Beta glucans do not naturally occur within the body and need to be consumed from sources such as mushrooms and yeast. Beta glucans stimulate the assembly of immune stem cells inside bone marrow. Beta glucan also stimulates various cells within the body to unharness anti-cancer molecules throughout the body. Over 1,000 scientific articles have been published reporting the many biological benefits of beta glucan. Compared to traditional medical therapies, beta glucans are affordable and a safe alternative for preventing and healing cancer. Hi Jeannine Skead, my experience with obtaining Beta Glucan has been with a company called Better Way Health. 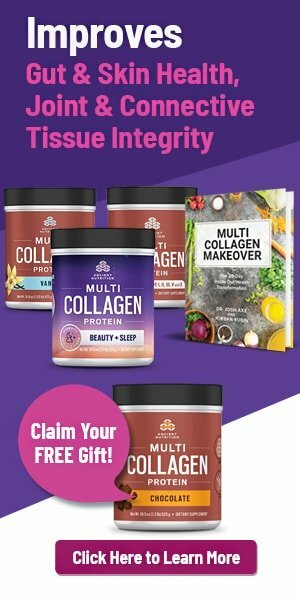 There is a great deal of information on that website about the high quality of their products and I found the staff to be super knowledgeable about Beta 1, 3D Glucan and the dosages. I found out about them through one of the “Truth About Cancer” webinars. All the very best to you. Thank you for the information. More people need to be educated about this. I have been taking supplements for over 25 years with emphasis in immune boosters and a clean gut. I have found the replacement of natural mushrooms (I do not like them:) it is call Immunizen, made by a company Unicity. The ingredients are so impressive I started taken them 1 year ago. I have not have a cold and my overall health is excellent at 69. I am oppose to vaccines so I take this supplement and I feel terrific. Thank you. I learned about Beta Glucan and used it to get off my cholesterol Med’s. I stayed on because I noticed I never seem to get colds anymore. I’m so sorry to hear about your father – I’ll be sure to pray for him. My husband is fighting stage 4 NSC metastasized lung cancer(unspecified). Two days ago he had an immunotherapy treatment (Keytruda). I recently purchased Beta 1,3D Glucan and am wondering if he can safely take this to help enhance the immunotherapy treatment and future treatments. I’m so sorry to hear about your husband – I’ll be sure to pray for him.